The general consensus seems to be that we'll see the announcement of the Samsung Galaxy S IV released around April, so there is bound to be a good amount of speculation over the device features during the next couple of months. One main point seems to be in figuring out what to expect from the display. The newest rumors are saying earlier reports are wrong, and that we should expect 1080p, but not an "unbreakable" display. 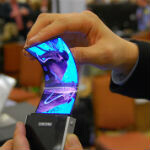 There has been a lot of chatter recently about flexible displays, or as they are bound to be marketed, "unbreakable" displays, and there has been a report saying that Samsung will be first out of the gate with a flexible display device. Unfortunately, people in the know are saying that the technology just isn't ready yet, and so there is little chance that it would make it into the Galaxy S IV, especially with the expected launch just a few months away. Of course, starting with the HTC DROID DNA, it looks like 1080p is the new standard for flagship devices, so that's almost a certainty for the Galaxy S IV. But, it looks like it may be more reasonable to expect the Galaxy Note III to have a flexible display, since that device likely won't be out until later in the year. Currently own the note 2,awesome device but if the note 3 will indeed feature a 6.3" screen then I will settle for the s3.breakable or unbreakable go Sammy. Well it would be dumb for Samsung to have a GSIV with a 5" screen and a Note III with a 5.5" screen. They would be too similar. Hadn't heard the Rumor about them increasing the size to 6.3" though. It all makes sense if it's true. I'd say : SGS4 : 4.9" , Note 3: 5.9"
Does the screen size really have to get larger? wow! somebody is actually thinking that besides me! Phones are getting too big now. It scares when I imagine holding an almost tablet-sized phone right by my ear. Phone and surfe then more! Things would really get interesting if they could make a screen that can fold in half size to use for normal phone operations and unfold to a 6 inch screen for more multimedia experiences. Samsung makes about 15-20 phones 4.5" and below!!! Isn't that enough smartphones to find what you tinys (tiny screeners) need... They make only 2 smartphones 5" and above, can't biggies (big screeners) have a few choices to pick from!!! Geeesz. It would be cool if they released a Flagship device with a 4.3" screen! No it doesn't have to. but the bezel have to get smaller. A sell out it will be. However I am more interested to see what Galaxy S IV killer Apple will come up with. The iphone 5S!!! Now with....uh....hmmm....diferrent colors? And....uh...NFC? Stay tuned, apple is upping their refresh cycle to twice a year so you'll see something new and different. If I am going with another Samsung device, it's going to be on Verizon because just recently I switched to an unlocked Note 2 and just today my data speeds have gone from 7-15mph down to a unbearable 0.20 down and it still shows H+ on my phone. I tried switching the APN and even called AT&T about it, they told me too bad because they don't support HSPA+ on unlocked devices. I think it would be even worse on T-Mobile. I am not in a T-Mobile HSPA+ area. I am in a HSPA+ area on AT&T and LTE on Verizon. But I switched over to AT&T because I wanted to start using unlocked phones on their network and then they decided to give me 3G only but charge me for 4G service? No thanks to that! T-Mobile is now trying to make HSPA+ as fast as LTE or close ,and that's why they're not not switching to 4G. I'm expecting close to 4G speeds on HSPA+ by T-Mobile. I understand that, but the problem is, they only have EDGE network in my area. AT&T worked perfectly when I had an AT&T phone but since I switched over to an unlocked one a week ago, last night they seemed to have turned my HSPA+ network off. Is it an AT&T unlocked One X or the international One X? LTE is really a batter killer. I have a Droid Razr Maxx and LTE (even when inactive) chews on the battery. When active (expecially with 1-2 bars) it eats the battery. I think Apple is really on the right track by making a special LTE chip. Hope other follow suit.